We have built a LOT of chicken waterers in our years of chicken wrangling. They break, clog, or otherwise just become a pain to deal with. No matter the size, filling it is always irritating. With that experience in mind, we set out to build an easy, affordable and quick to put together rain water chicken waterer. 55 Gallon plastic barrel ($7) – don’t use clear/translucent as such could promote algae growth in the water. Note: that might not sound inexpensive to some – but bear in mind it has all be eliminated all water hauling for the chickens for about 9 months of the year and has eliminated the need to use well water for the same duration. Once the materials arrived, we simply laid out eight holes about 2″ up from the bottom of the barrel and drilled them (the drill bit size recommended comes with the packaging for the drinker cups). Next, we screwed the cups in the filled the water up several inches above the cups to and let it sit a while to ensure there were no leaks. We then drilled a hole for the fill hose adapter that came with the rain barrel diverter and screwed in the adapter. Installation was easy. Just make a cut in your gutter, slide the diverter on (requires some finagling) then trim down the excess gutter, insert it into the bottom of the diverter and re-attach all to the wall. Note: we found that this all worked best with some silicone caulk around the inside. Fiskars should really have designed this to slide INTO the gutter, not over it. Physics – duh! Once all that was done, we simply trimmed down the hose to our desired length put the diverter into the ‘divert’ mode and waited for rain. What does that mean you ask? The inside flips over to direct all water down the spouting (ie. in the winter) or flipped the other way directs water first into the barrel. When the barrel is full, the back pressure of the water causes it to flow back into the diverter where it exits via the gutter. The first mild rain filled the bucket half way. We’ve not watered our chickens by hand since the installation! We used our fingers to allow enough water to flow into each cup. From there the chickens figured it out quite quickly. The Fiskars diverter works okay, but required caulking and some tweaking of the positioning to get the water flowing properly. Take time to observe the water flowing into (hopefully) the barrel during a rain. This won’t work when it begins to freeze, but sure saves labor and time until then! We’ve had a few seasons of raising pastured pork and are starting to understand the pros and cons. 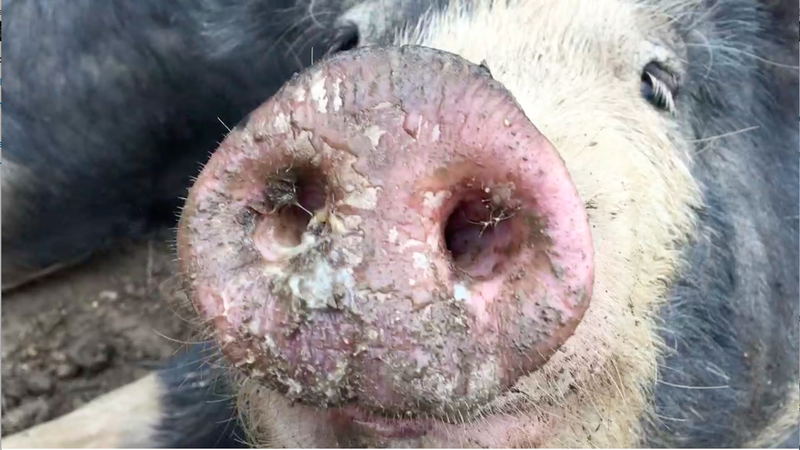 We aim to share them here for those who really want to understand some of the potential blessings and hardships associated with raising pastured pork. We love Joel Salatin. It was largely his videos on pigs raised in the forest that got our feeble minds thinking we could do this. Nevertheless, an hour or two of his videos don’t adequately portray the months of experiences one will have raising pigs in a forest, meadow, field, or pasture. Joel Salatin makes it look easy! It isn’t super hard, but it’s not super easy either. If you have a good docile breed, your pigs will be very happy in a pasture or woods vs a concrete slab (a common approach). Pigs are intelligent animals that enjoy exploration, space, community, and movement. Pastured pigs enjoy these in abundance. If you plan on eating these pigs, you’ll have the satisfaction of knowing they lived a very happy life (except one day). Your pigs will taste better than the average pig (assuming you feed them good food). Remember, you are what you eat and you are what you eat eats! They’ll clear your land of more or less all vegetation minus large trees. If you intend to sell them, there is a potential market for pasture-raised pork. Your pigs will taste better than any pork you could purchase at the store. Pigs -especially piglets- are fun to watch and be around. Pigs don’t require much infrastructure. If you get them young enough to train to an electric wire/fence, you can house them for very little. This is a huge plus compared to other homestead/farm animals. Only rabbits are simpler. Pigs will make good use of your quality garden and kitchen waste. More of the calories you purchase or grow will end up feeding you if you have pigs. Example. When we buy bushels of peaches to can, we skin them, can the fruit, then run the skins through a juicer. This gives us peach juice to freeze, can, or use in smoothies, and then some skin pulp and pits. The pigs will eat the skin pulp and the pits, leaving us with zero waste! If you raise pigs in a field, forest, meadow, or pasture, that is where they’ll most likely be when you go to round them up for slaughter. This is NOT an easy task in many cases. Many YouTubers, movies, and bloggers have idyllic photos and videos of homesteaders and farmers frolicking with their pigs. That may be true for about 5 minutes, or on days when you and they have nowhere special to be. As soon as you roll up with a trailer and they see you salivating at the thought of eating them as ham and bacon – you’ll soon find out how belligerent a pig can be! A pig is a like an impetuous 300lb bodybuilding two-year-old. Catching them requires work and ingenuity. It might also take some nerves. A caught pig makes a lot of unsettling noise. If you have to deliver a live animal to the butcher, it’s going to take some effort. On average, it takes us 70 minutes per pig to gather and place in a trailer. Oh, and that is for 4-5 strong and fit men (over the age of 16)!Pigs can feel intimidating, even if nice. They make noises that can be unnerving to some. When they do this while swarming you, especially when over 200lbs each, this can make a gal or fella a bit uneasy. They probably won’t hurt you, and are likely just wondering what goodies you might have brought to the party. Nevertheless, this can be a scary experience for new pig owners.Pigs create mud out of thin air. Seriously. You can have a nice dry patch of woods and inside of a few weeks, it will look like a scene from a National Geographic report on catastrophic mud slides. Pigs create muck and in copious supply! Walking in said muck is tough. Add rain to that muck and it is very easy to be in mud up to mid-calf. In our very wet mountainside, this is discouraging at times. Your “pasture”, unless quite large, will likely be mostly a mud lot when the pigs are through with it. Pigs can feel intimidating, even if nice. They make noises that can be unnerving to some. When they do this while swarming you, especially when over 200lbs each, this can make a gal or fella a bit uneasy. They probably won’t hurt you and are likely just wondering what goodies you might have brought to the party. Nevertheless, this can be a scary experience for new pig owners. Pigs create mud out of thin air. Seriously. You can have a nice dry patch of woods and inside of a few weeks, it will look like a scene from a National Geographic report on catastrophic mud slides. Pigs create muck and in copious supply! Walking in said muck is tough. Add rain to that muck and it is very easy to be in mud up to mid-calf. In our very wet mountainside, this is discouraging at times. Your “pasture”, unless quite large, will likely be mostly a mud lot when the pigs are through with it. Pastured pigs take longer to raise (potentially). You can’t go by books written for commercial or economical pig-raising. 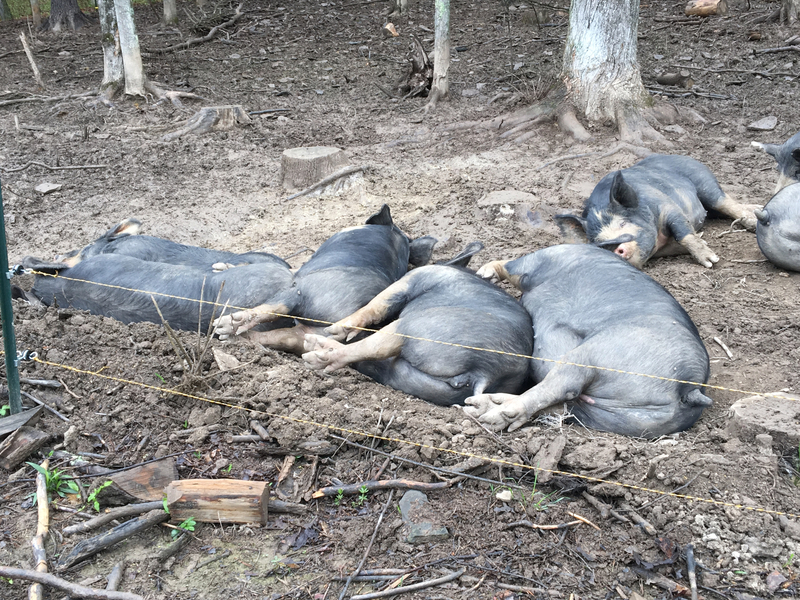 Pigs raised on a 16′ square of concrete who cannot forage or root are going to fatten up much faster than a very fit and active pig galavanting throughout the forested glen or meadow. Pigs that are being raised in the cold will dedicate some of their calories for staying warm rather than growing larger. This means it takes more feed. If you’re raising pastured pigs, you’re most-likely using quality feed, which means you will need MORE of it. All around, this makes for a more expensive pig. That’s okay! Just be realistic about it. The majority of people who might want to buy your pork are used to grocery store prices. Most of those people will not understand and therefore purchase your more expensive pork. All most consumers will think is that the sale paper pork is way less than yours. Ah, but you say you can raise them cheap! If your feed is entirely free – maybe.Pigs might eat anything/everything, but it doesn’t mean they should or that eating a pig that has eaten everything/anything is a good idea! Don’t get pigs thinking you’ll feed them the scraps from your town or community. Yes, they will eat it and get fat doing so – but you will be eating them and therefore eating the same scraps. Feed pigs quality feed and they’ll give you quality meat. Pigs might eat anything/everything, but it doesn’t mean they should or that eating a pig that has eaten everything/anything is a good idea! Don’t get pigs thinking you’ll feed them the scraps from your town or community. Yes, they will eat it and get fat doing so – but you will be eating them and therefore eating the same scraps. Feed pigs quality feed and they’ll give you quality meat. Pigs cannot always be butchered when you need them to be. Butchers have busy schedules and many butchers have seasons they do and don’t butcher pigs. Getting your butchering done when you and the pigs are ready might prove challenging. Select your butcher and understand their schedule before bringing home your pigs. All in all, raising pigs has been a great experience – one that we intend to keep doing. However, it’s not without its challenges and knowing these beforehand can be helpful. Have a question or comment about raising pigs? Chime in below! In this post, we’ll show you the simple steps we took to setup our goat barn with solar-powered lighting and running water. Note: Though titled as ‘simple’, some will no doubt find this complex. Understandable, however, nothing beyond grade-school math or a calculator is necessary for figuring this out. Take your time and try to understand it, ask questions in the comments if you don’t understand. Our goat barn is over 1000′ from our home, and the thought of running power to it gives us heartburn. Not only would that be tremendously labor-intensive, but also expensive and disruptive. We needed power to light the goat barn when we needed to be in there in the dark, and also to support having running water. We don’t spend more than one hour per day in the goat barn, so the true amount of time we would need to light it or run water was small. To determine what we needed was fairly simple. First, we located the 12v LED lights we wished to use. We wanted something simple and common and found these on Amazon. They had good reviews and only consumed 7w while running. We knew we wanted to install four light fixtures but typically would only have two on most of the time the lights would be on. The maximum “load” of these bulbs (the watts times the hours to get Wh) would be about 28 Wh/day, or .028 kWh. Next, we knew we needed to pump water from our rain tanks into the barn and out through a faucet and utility sink. This too was easily accomplished by using a 12v Shurflow RV water pump, also available on Amazon. This pump has an internal pressure switch which will turn the pump on when the pressure is low (ie, when a faucet is opened). However, we had an old pressure tank laying around and wanted to run the pump less often than every time we opened the faucet, so we hooked up the pump to fill the pressure tank. When the tank reaches pressure, it triggers the pump to turn off and also has plenty of pressure at the faucet. The maximum load of this pump we calculated at about an hour per day (which is very conservative since it runs more like 10 minutes a day). The amp draw is about 6 amps, so we calculated 12 Volts x 6 Amps = 72 Watts for one hour a day equals 72 Wh or .072 kWh. So far, we need to support less about 1 kWh per day. No problem! Now, we’d not typically recommend using deep cycle marine batteries for solar applications, because they’re really not designed for multiple cycles of deep discharging – something you regularly do with solar applications, but we had two on-hand, and let’s be reasonable – we needed to support some pretty small loads. So we wired these together in parallel, which keeps the voltage at 12 V but combines their amps. We did this to be sure that we’d never discharge the batteries below a very very small margin of their capacity, which helps them last a long time. To help understand how this works, picture this… treat your batteries like a bank account. Treat your loads like withdrawals and your solar input like deposits. If you withdrawal more than you can put back in, you have a deficit (a dead battery). You need to size all your components so that the ratio of withdrawals and deposits keeps the battery happy. Our system would take about 100 watts per day from the batteries. We need to put at least that much back in. Now.. to figure out what kind of solar panel to get, we needed to know about how many hours of sun we could expect on average. This is called “solar insolation”. There are many useful maps online that show what average hours are for any area. Ours is approximately 5.5 hours. This means that the average amount of usable sun hours per day, across all days of the year and average weather – would be 5.5. We also had to keep in mind that our batteries had to be adequately sized so that we could withdraw 500-700 watts of power from the batteries without significantly discharging the batteries. This is why we used two because the amount taken out of each would be small. With something like a deep cycle battery, you shouldn’t really discharge them more than maybe 20% or you risk killing the batteries. Some solar batteries support much deeper discharges, but not these. The gist is that you need to make sure that after taking all you plan to take from your batteries, you still need to have the right amount of energy remaining. The percentage of how much of the battery energy you can safely take is called the “Depth of Discharge” or “DoD”. Our DoD would be 20%. If we had been buying new batteries, we would have needed to buy batteries where 20% of their capacity was enough to supply 500-700 Watts. Solar batteries are measured by Amp hours. We have watts. How does that work? Well… take your watts, divide by the voltage of your system and you have the Amps. Now multiply the Amps by the hours you need them. This is where it gets tricky because we don’t need our energy all at once. The most we will ever need at once is about8.33 Amps. How did I know that? Because, our total wattage, while everything is running is 72 Amps for the water pump plus 28 Watts for the bulbs or 100 watts total. Our system voltage is 12V (the voltage of the batteries, the soon to be solar panel, etc). 100 / 12 = 8.333. If we ran all our loads for one hour, we would withdrawal the power at a rate of about 8.3 Amps per hour (8.3 AH). Assuming we need that for seven days, we’d need a battery that could support 8.3 AH for 7 days with a total of 58.1 AH. Now… remember, we can only take 20% or so, so we actually need a battery that has a capacity 5x as much to get what we need out of 20%. 58.1 * 5 = 290.5 AH. Most solar batteries are measured in AH at 20 hours. Forget about what that means for now, but that is the number you want to compare when looking at your total AH needs vs the battery capacity. So, to summarize, to support 58.1 AH of need, we need a 290.5 AH battery. That gives us all the storage we will need to support 7 days of 1-hour per day usage and still not kill our battery. We needed a panel that provided as much resupply of watts to our depleted batteries as we’re taking out, plus a little room for margin. We were going to be taking out about 700/week, so we need to make sure we could at least put that much back in. So, we have 5.5h of sun per day on average, and 7 days to collect the sun during that week, that means we had about 38.5 sun hours per week to harvest about 700 W of power. You shouldn’t just divide 100 w by 5.5 hours because there are a few more elements to consider. Namely, how many days we’d want to be able to run without any sun. We can get a week or so of no meaningful sun in our part of the world. We want to make sure our stuff works when this happens, so we might need to have 5-7 days of withdrawing 100 Watts of power, but with no deposits. Since that represents best-case scenario and the weather and sun isn’t constant, we didn’t want to just divide 700 W by 38.5 sun hours and figure on an 18 W solar panel. It might work but would more often than not be insufficient. We decided on a 100 W solar panel from the great folks at Alt-E Store. They’re super-helpful, have a great YouTube channel, and are eager to help. With a 100W panel operating at let’s say, 85% efficiency, we could potentially collect 3,272.5 Watts of power in seven days, or 467.50 Watts per day. Since we only should use 100 watts per day, this left us plenty of buffer and room to grow a little. We added this mount to a schedule 40 iron pipe placed 3′ into the ground and were ready to go. A charge controller is an important piece of the puzzle. Some try to be cheap and avoid them to their potential peril. A charge contoller manages the incoming solar power and charges the battery until the battery is “full”, at which time it prevents over-charging of the battery. They also often have a ‘blocking diode’ of sorts that prevents the energy in the battery from flowing into the solar panels when there is no sun (i.e. at night). We purchased this charge controller for that use. It is important to note that you need to have a charge controller that can support the charging amps you’ll be putting into it. Those charging Amps are a measure of the panel watts divided by the panel voltage (100 W / 12 V = 8.3 A). Your charge controller should be support slightly higher than your maximum charging Amps. Ours is 10.5 so we’re good. To add some additional security and also to make things more organized, we purchased a marine battery terminal block on Amazon. We landed all our circuits positive wires to this block and all the negatives to the negative block it came with. This also gave us the ability to add fuse protection to all the circuits using auto fuses. From there we simply wired everything together and turned it all on! We then use the RV (Shurflow) water pump mentioned above and pump the water through a standard household water spin-down filter and a carbonb filter into a surplus pressure tank that we had on-hand. Oh… and we also have found that a 1/2″ PEX/SharkBite check valve is essential to make this work well – prevening the water from draining back into the tanks and keeping the pump primed. The pressure tank can be turned on/off with a valve in-case we don’t want to bother with it. It can help the motor run less often by storing pressurized water. The pump has to run for longer periods of time, but less often. This can be handy for say… filling the pressure tank during peak sun hours then using the pressurized water during non/low sun hours. The multiple ways in which drones can be used for the small homestead. We typically like to keep things pretty low-tech. We don’t have an aversion to technology, we just want to do things by means which are easily repeatable by anyone. Nevertheless, there are a few modern technologies that can be really helpful at times. Drones are a good example. We have found the use of a drone to be time-saving or generally helpful in several ways. Planning gardens can be complex when trying to get an idea of the overall “fit” of the garden(s) into the surrounding landscape, even more so if those gardens are landscape-oriented. Aerial photos of the surroundings can serve as a nice backdrop for planning. We send the drone up to take photos from different angles. We then import or paste those photos into a word processor (Pages for Mac in our case) and then adjust the opacity to about half. We then crop the photos, print them out and then use these to make sketches of our garden beds, landscaping, etc. Drones allow us to get photos from nearly any perspective which allows us to sketch out ideas from nearly any perspective. Drones can also provide helpful aerial perspectives of shadows of the area under consideration. Simply launch the drone to the same altitude/location once per hour of the time you anticipate solar exposure. Do this for each season and you can get a rough idea of the shading of the area throughout the day and seasons. This can be helpful in determining solar panel placement. Of course, an easier way to do this is with a Solar Pathfinder ( an excellent tool for homesteaders). There are numerous forms of inspections where we’ve found a drone to be a helpful addition. One summer, while doing some light excavating, one of us had the unfortunate experience of scraping the lid off of a very large, underground Yellowjacket colony with our tractor. Fortunately, we were able to turn off the tractor and run away without getting stung. Those kinds of scenarios can be fatal you know! Similarly, as beekeepers, there have been times where sending the drone over to the beehives has been more expedient for our needs than suiting up in bee suits, firing up the smoker, etc. Likewise, a drone can be used to get some perspectives on swarms or atypical behaviors. Note: We don’t like to annoy our bees (or any bees), and would advise keeping drone activity near a hive to a minimum. We have roof-mounted solar panels. We can’t see them from the ground due to the shallow pitch of the roof. A drone has come in handy numerous times to check the health and status of the solar panels. This is most helpful in the winter to check for snow and ice build up. After all, who wants to climb on a roof in snow and ice?! A quick drone flight can spare us the need to get out a ladder and climb on a roof. The detail level of a drone cannot match a visual inspection, but it can determine if such attention is necessary. It’s much safer than climbing a ladder! It can also be helpful in determining if out-of-reach gutters need to be cleaned. Similar to fences, making brief checks on small animal herds is also a helpful way to use drones. If you want to check on the location or general well-being of some animals, or perhaps help locate a stray animal, a drone can be a useful companion in such a task. Rather than risk confrontation with persons of unknown character and intent, a drone can provide a means of monitoring and recording of trespassers (in daylight at least) and provide photographic/video evidence if a legal need to do so becomes necessary. It used to be that you had to pay companies to get aerial photos of the family home and farm. These days, you can buy a drone for a fraction of that cost. Furthermore, you can get aerial photos and videos of your property annually, serving as a nice record of the changes over time. These photos and videos will be important to the generations that come after you. If the time comes to sell your homestead, aerial photos and videos of your homestead provide a unique perspective on your property to the prospective buyer. Homesteading is gear/tool intensive. Below are some items we feel are indispensable to our homesteading operation. These are in no particular order, except the first. It was a couple years into homesteading before we were able to get a tractor. Now, we can’t imagine homesteading without one. A tractor saves our bacon on a routine basis. They are amazingly labor-saving. We use a tractor for everything from moving material, digging holes, plowing snow, driveway maintenance, moving heavy items, etc, etc. There are few jobs that a tractor cannot make better. If you don’t own one, get one sooner than later. This often overlooked tool is essential at our homestead. Combined with a tractor or ATV, the right chains can accomplish many tasks. Useful for securing and lifting loads with a tractor, dragging tree and logs, ripping brush and trees out of the ground… the list goes on and on. Chains are expensive but worth their weight in silver! One doesn’t necessarily need Muck Boot brand boots, but these sorts of boots are indispensable to our homestead. They are great to slip on for chores and piddling about the property. They hold up well – about two years of daily use for us. We like the Muck Boot Chore ST (steel toe) for our purposes. Steel toe is worth it, especially if you’re going to deal with firewood or hauling around heavy materials. This basic tool gets used almost daily on our homestead. Weekly at a minimum. Drivers are ultra useful for building and fixing. We’ve come to enjoy the DeWalt 20v Max Drivers commonly available at big box stores or Amazon. When we know we have work to do in the dark, which is often, especially in winter – a headlamp is essential. Because we use them a lot, we’ve found it best to just get something of average quality. Petzl and Pelican and Princeton Tec all make a good headlamp. Recently we kickstarted the ONE80 Trek and headlamp project. The belt lamps are entirely awesome for homesteading and are amazingly bright. The batteries don’t last very long (1.5-2h) but are quickly rechargeable. We just keep a spare with us. There isn’t a day that goes by where I don’t reach for my pocket flashlight. Dusk and dawn animal chores, finding small parts that get dropped, peering in dark places… it is used all the time! We’ve really come to love the Streamlight Stylus ProStreamlight Stylus Pro. It’s an affordable pen light that comfortably fits in a pants pocket, runs on two AAA batteries, and seems to run forever without battery replacement. We particularly like its durability and how it feels in our hands, even with gloves on. The five-gallon bucket is perhaps one of the best inventions ever. Gamma Seal Lids make a great thing even better! These lids make five-gallon buckets air and water tight. They’re very useful for keeping critters out of feed, chickens out the bucket waterers, hauling water without spilling, and on and on. The lids are slightly expensive but well worth the investment. We store a LOT of feed. We also store lots of garden amendments, forage crop seed, etc. Used 30 and 55-gallon (usually plastic for us) drums with clamping lids have been a great and affordable solution for such. A new trash can from a big box store can be $25-$40. These barrels (used and rinsed) are often sold below $10 in our area and accomplish the same thing, but with even better durability. Used drums without lids also make a great way to store long materials such a scrap metal, PVC, pipe, or other longer upright odds and ends. Unless your land is entirely free of trees (which doesn’t sound like the nicest of homesteading environments), you are going to want a chainsaw and appropriate chainsaw-related safety gear. Clearing land, cleaning up deadfalls, processing firewood… all things a chainsaw handles with ease. If you haven’t bought one yet, consider buying a top-quality chainsaw, an extra bar, chain files, and several extra chains. This one is intentionally last. Homesteading involves lots of blood, sweat, and tears. Minor injuries, sprains, scrapes and bruises are common. Several good first aid kits, strategically positioned in the best places can provide quick relief when injured. Tractors, ATV or UTV vehicles are often used for mildly dangerous work and at a distance from your home and can themselves be sources of injury. Consider it essential to have a first-aid kit on board such vehicles. They could save your life. Stock your homestead vehicle first aid kits with a few extra items such as Quick Clot, an Israeli Battle Dressing, and perhaps a military tourniquet. Of course, without the proper understanding of how to use these items, they won’t do much good! Therefore, gain the proper training to respond to field emergencies that you may encounter. Have essentials of your own to recommend? Share with us in the comments. Like this post? Please click the Like button. We don’t budget for food. Gasp! We are of the belief that “we are (quite literally), what we eat”. Why then would we want to be frugal or even worse – stingy – with what we place into our bodies? We are all about wisely using the resources we have available to us. However, we often scratch our heads at the concept of trying to feed a family for as little as possible. That can be somewhat self-defeating. Americans have one of the lowest ratios of food cost to income in the entire world. We spend less on food that nearly every other country on planet earth! Yet, we still often want to spend even less! Consider this… if someone can go through all the trouble to feed you and make a profit and you only spend $.99, how good can the quality be? What value can a “value meal” have in such a case? The only “value” is to the producer. The consumer may feel full but is not consuming quality. We raise (among other things) pigs. We feed them non-GMO feed produced by a local small producer.They can’t produce feed for the cost of feed from the local mills typically. Because it costs us more, we couldn’t sell a pig for what others who feed less-premium feeds could. We simply couldn’t sell a pig fed on premium quality feed and beat $.99/lb prices found in the grocery store. Fortunately, we don’t aim to! So as both producers (for ourselves) and consumers, we want the best quality foods possible. If those cannot be obtained inexpensively, we will spend more for food before we will eat lesser-quality food. We once heard it said “You make your healthcare decisions at the grocery store. You make your sick care decisions at the doctor’s office.” We couldn’t agree more. We live in a culture that is conservative on food spending but liberal with “health” spending. We’ll think nothing of spending $500-$1000 per month on health “insurance” but half that or less to feed our family. Folks, good food nourishes far beyond the best medicines. Food and nutrition should be a high priority in the budget – perhaps the highest. For some, all that is needed is a shift – spend less on sick care and more on quality nutrition. Raise your insurance deductible and use the extra funds on a bigger grocery budget. When we did so, we found our doctors visits dramatically declined. We get it – some folks have little to no choice with their budgets. Nevertheless, most of us, with a change in our thinking, can find resources for the things we value. Place yourself and your family at the top of your list, not your insurance company or Physician. Thermacore panels are the technical/trade name for insulated garage door panels. They have many valuable uses on a homestead or farm. At $.70/sqft (in our area), they are among the least expensive options for most cases where they can be used. Thermacore panels are painted steel panels filled with about 1 – 1.5″ of solid foam. They have an Insulation value of about R-9 and because they’re steel, have the possible added benefit of being compatible with magnets. Because they’re metal, they cannot easily decay and are easily cleaned with a power washer, etc. Remember… these are made for garage doors. The panels are easily cut with standard power tools. We use a circular saw with an old blade installed in reverse. We make finer cuts for fixtures and such with a jigsaw with a long metal blade. One of our favorite uses for Thermacore panels is for finishing walls in outbuildings, basements, etc. Compared to installing (and more importantly, finishing) drywall (“sheet rock”) which takes several cycles, Thermacore panels go up very, very fast by screwing them to the framing. With some forethought in framing, they are very structurally sound and stiffen up walls much more than drywall does. If one is okay with the white-colored finish, the attached panels provide a surface that needs no other finishing aside from a wipe down with a damp rag. We prefer to install the panels vertically because of the paneled appearance of the panels. When doing so, we have found it adequate to fasten with self-tapping hex screws (3″) at the top and bottom and if possible, the middle of the panels. Usually this requires about a dozen screws per panel. This also sometimes requires horizontal blocking in wall framing About half way up the wall. These panels are about 1.25″ thick. There is a .25″ gap between the panel and lumber above because it has not yet been fastened tightly. If installed horizontally, just fasten to the wall studs as you would with drywall. The panels are designed with edges that slightly overlap the next panel creating a nice fit. Thermacore panels make great wall sheeting for barns, mudrooms, root cellars, rabbitries, some animal stalls (and with great care to handle sharp edges!) and more. Thermacore panels are very strong. We’ve seen them used for canning shelves, with vertical supports about every four feet. We use them ourselves for barn shelving that hold the largest of plastic tubs filled with all manner of supplies. They are very quick to put up and much less expensive per square foot than a comparable lumber solution. Further, since they’re metal, they’re more forgiving to spills and such. Thermacore panels make for very quick and easy garden beds. We’re able to secure them locally in 21″ and 24″ widths and just about any length. Married with 4″ x 4″ corner posts and decorative caps and you have some very nice (and deep) raised garden beds. These panels are metal, and as such could potentially rust if areas without paint are exposed to ground moisture for long durations, but we feel that is less likely to happen compared to wooden beds that would likewise rot. Thermacore panels would also make great (though opaque) walls for cold frames. Since these panels have an insulation value of R-9, they provide a very easy means for insulating the sides of a cold frame. Too tall for your liking? Just bury them a few inches into the ground. As with wall sheeting, Thermacore panels make for a very fast ceiling solution. Our bank barn has a lower level that is exposed the elements. Thermacore panels attached to the underside of the floor above not only insulate the floor above, but also prevent bees, birds, snakes, and mice from utilizing the space between the rafters.